There was a time in this fair land, back when there was something called “common sense” and “basic moral reasoning” when “illegal immigrant” meant one had broken the law. There was a time when saying “criminal illegal alien” amounted to a tautology, the needless repetition of an idea. But in today’s Bizarro Obama universe, there are non-criminal illegals. If the illegal immigrants continually streaming in from Mexico voted Republican, Obama would be doing everything imaginable – including breaking the law – to keep them out. Instead, on the one hand, Obama is allowing illegal aliens into the country to curry favor with the Hispanic vote, even as he helps blue states from counting the votes of our soldiers overseas to suppress their overwhelmingly conservative vote. ICE Assistant Secretary John Morton, seen here, wrote the Aug. 20 memo to Peter Vincent, principal legal adviser and head of the agency’s removal operations. “This administration is committed to smart, effective immigration reform, prioritizing the arrest and removal of criminal aliens and those who pose a danger to national security,” Rocha said in a statement. “In 2010 to date, ICE has removed more than 150,000 convicted criminals — a record number. “Improve docket efficiency”? Hey, I have an idea: let’s refuse to deport the illegal immigrants guilty of terrible violent crimes. That would “improve docket efficiency” even MORE. Don’t worry. That’s coming next. Oops. Too late. It’s already here right now. The patchwork array of sanctuary cities around the country is leaving dangerous criminal illegal aliens on America’s streets. Local municipalities in these sanctuary cities prevent their officials from reporting illegals—even those with criminal records—to Immigrations and Customs enforcement (ICE), and it is costing American lives. Obama wasn’t content to personally and publicly demonize Arizona as a racist state. He wasn’t content to invite Mexican President Calderon to the Capital to demonize Arizona as a racist state. He wasn’t even content to sue Arizona for a law identical to the U.S. law (while ignoring all of those sanctuary cities which specifically break U.S. law). No, he proceeded to bring Arizona before the United Nations Human Rights Council. But don’t worry. Justice will be done at the Human Rights Council, where highly repressive regimes as China, Cuba, Libya, Saudi Arabia, Sudan, Syria, and Vietnam have served. Not to mention Zimbabwe, Algeria and Pakistan. In 2003, Bush confronted a UN Human Rights Commission which at the time consisted of Libya, China, Sudan, Syria, Saudi Arabia, Zimbabwe, Cuba, Vietnam and Russia. That’s the kind of human rights champions we’ve got. Currently, Iran is on the UN panel for women’s rights. Because Iran gives such great rights to women, after all. Except for THIS woman, of course. Okay, and maybe this one. Obama threw a state of the union to the wolves. And hoped the vicious international big government totalitarian regimes would tear Arizona a new one. Because that’s just the kind of guy this man who cozied up to a Venezuelan dictator thug and literally bowed down before the king of Saudi Arabia (one of the nastiest purveyors of human rights abuses on the planet) truly is. The Arizona border is totally out of control. 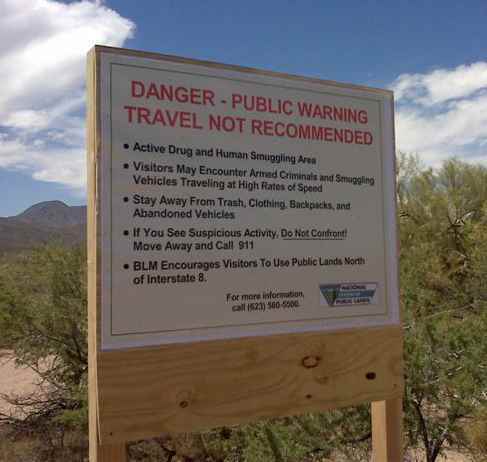 The Obama administration – which refuses to lift a finger to help the state even as it prevents it from being allowed to do anything to help itself – put up signs warning US citizens that swaths of Arizona were basically no longer safe for Americas. It was rather restricted for use by violent criminal illegal aliens. Boy, I hope all these drug and human smugglers Obama gave Arizona to have well-known criminal records. Because otherwise Obama invites them to stay as long as they like. Soon we’re going to be able to “deport” Democrats from office. They’re the ones who made travesties like this possible.